SEBASTIAN – On April 10th, many people in Sebastian, Fellsmere, and Vero Beach plan to celebrate Florida Gopher Tortoise Day and support conservation of this threatened species. The Florida Fish and Wildlife Conservation Commission (FWC) has encouraged Floridians to get involved in Gopher Tortoise Day since 2016 and share awareness of how people can help this species that is found in every county of the state. In 2017, Gopher Tortoise Day resolutions were adopted by Charlotte, Collier, DeSoto, Indian River and Sarasota counties, and the cities of Cape Coral, Flagler Beach and Venice. 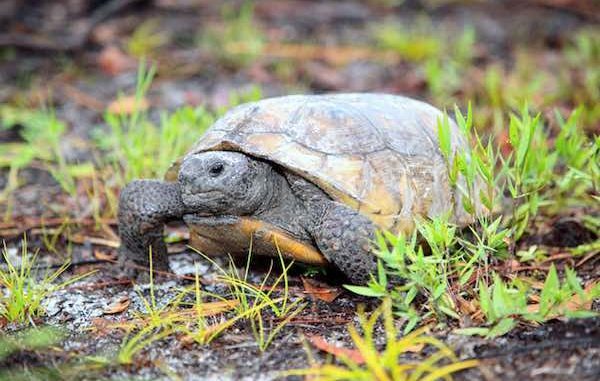 “If you’re a fan of the gopher tortoise, help us spread the word on conserving this threatened species, whose burrows are home to hundreds of animals, including the eastern indigo snake, gopher frog and Florida mouse,” said Deborah Burr, who heads the FWC’s gopher tortoise management program. On the Gopher Tortoise Day website, you can access many resources, including a resolution template for your community to adopt Gopher Tortoise Day, A guide to living with gopher tortoises, gopher tortoises and road safety and ideas for kids’ activities, including Build a Burrow instructions and the Gopher Tortoise Field Trip Guide. You also can help by using the Florida Gopher Tortoise smartphone app to report gopher tortoise sightings and learn about the species. Gopher tortoises need plenty of sandy, sunny habitats with an open tree canopy to thrive and survive. The FWC’s wildlife management areas provide habitat for gopher tortoises. Local governments, military installations and private landowners, including farmers, foresters and ranchers, also work with the FWC to help conserve and restore gopher tortoise habitat. If you see gopher tortoises or their half-moon shaped burrow entrances, it is best to leave them alone. It’s illegal to disturb or harm gopher tortoises, their burrows or their eggs. You can help a gopher tortoise cross a road, by picking it up and placing it on the roadside in the direction it was heading. But only do this if it is safe for you to do so, and don’t put the tortoise in your vehicle! Remember too, the tortoise is a land animal, so never attempt to put it into water.